Mammalian cells require sufficient amounts of iron to satisfy metabolic needs and to accomplish special functions. 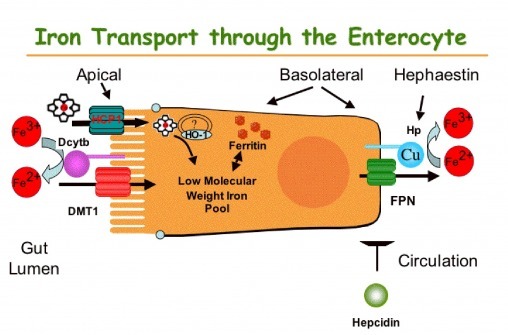 Iron is delivered to tissues by circulating transferrin, a transporter that captures iron released into the plasma mainly from intestinal enterocytes or reticuloendothelial macrophages. However, iron is also potentially toxic, because, under aerobic conditions, it catalyses the propagation of ROS (reactive oxygen species). The vast majority of body iron (at least 2.1 g) is distributed in the haemoglobin of red blood cells and developing erythroid cells and serves in oxygen transport. Significant amounts of iron are also present in macrophages (up to 600 mg) and in the myoglobin of muscles (300 mg), whereas excess body iron (1 g) is stored in the liver. Mammals lose iron from sloughing of mucosal and skin cells or during bleeding, but do not possess any regulated mechanism for iron excretion from the body. Therefore, balance is maintained by the tight control of dietary-iron absorption in the duodenum. The uptake of nutritional iron involves reduction of Fe3+ in the intestinal lumen by ferric reductases such as Dcytb (duodenal cytochrome b) and the subsequent transport of Fe2+ across the apical membrane of enterocytes by DMT1 (divalent metal transporter 1). Directly internalized or haem-derived (in this case, it is used another apical transporter called HCP1 (heme carrier protein 1) Fe2+ is processed by the enterocytes and eventually exported across the basolateral membrane into the bloodstream through the solute carrier and Fe2+ transporter ferroportin (FPN). The ferroportin-mediated efflux of Fe2+ is coupled by its reoxidation to Fe3+, catalysed by the membrane-bound ferroxidase hephaestin (Hp), that physically interacts with ferroportin. Exported iron is scavenged by transferrin (Tf), which maintains Fe3+ in a redox-inert state and delivers it into tissues. The Tf iron pool is replenished mostly by iron recycled from aged red blood cells and, to a lesser extent, by newly absorbed dietary iron. Senescent red blood cells are cleared by reticuloendothelial macrophages, which metabolize haemoglobin and haem and release iron into the bloodstream. The ferroportin-mediated efflux of Fe2+ from enterocytes and macrophages into the plasma is critical for systemic iron homoeostasis. This process is negatively regulated by hepcidin, a liver-derived peptide hormone that binds to ferroportin and promotes its phosphorylation, internalization and lysosomal degradation.